Every online business focuses on converting its website visitors into customers. In means to achieve this, pop-ups are used. Pop-ups are considered potent at arresting user’s attention and achieving consumer goals. Websites these days are parting ways from using pop-ups because of the amount of complaints they receive from the visitors. The ultimate challenge lies in using pop-ups in a fashion that doesn’t hamper user experience or lead to too many queries. You simply can’t fulfill everyone’s needs but you sure can use pop-ups to amplify your website’s conversion rate without interrupting the smooth user experience of your website. Etoile Info Solutions, Best Website Designing Company in Phoenix Arizona AZ is well equipped in delivering high end websites and can help you overcome this barrier. Let’s take a closer look at ways you can use pop-ups to boost conversions without impairing the user experience of your website. Omit Entry Pop-ups: Trust me, visiting the site for the first time and coming face to face with an entry pop-up is the bane of user experience. You can simply bid farewell to that user. 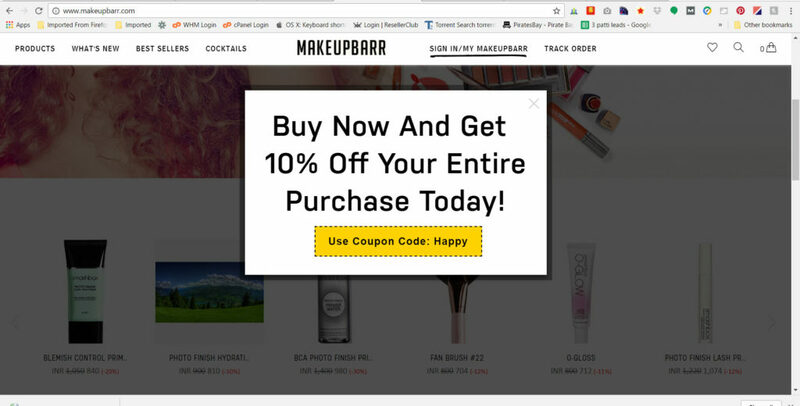 Entry pop-ups hinder typical browsing and reading flow. Instead opt for exit pop-ups. Exist pop-ups only appear when the visitor is leaving your site. This way their browsing and reading flow will not be ruptured and they might stop to look at the pop-up. Provide Relevant and Valuable Content: Another reason people have grown to dislike pop-ups is probably because most of them are pure waste of time with irrelevant and invaluable content. If your pop-ups are designed to solve visitor’s problem, structure the right solution or deliver answers to their questions, the pop-up would not be considered as annoying. Another useful way to improve user experience by way of displaying a pop-up is by using it as an ancillary navigational tool. Instead of promoting a brand or highlighting an offer, you can use pop-ups to redirect traffic to your most profitable pages or content. This will ultimately increase your conversion and improve your user experience. Customize your Messages: Your website may witness visitors from different sources with varied needs and goals in mind. They may be looking for different subjects and services, and may respond differently to your generic marketing messages. To enhance the user experience and to keep them engaged when you use pop-ups on your website, personalize the messages your pop-ups contain targeting different audience segments and customer groups. Tailor made messages is the beacon of digital marketing. The same way you personalize different web pages for numerous visitors, you should do the exact with your marketing campaigns to suit different sets of customers. Carry out A/B Testing: It is crucial to undertake A/B testing to determine which pop-ups are relevant for your website and which are not. This A/b testing will enable you to segregate the messages and design elements that work and those which don’t, while telling you what should stay and what must be removed.